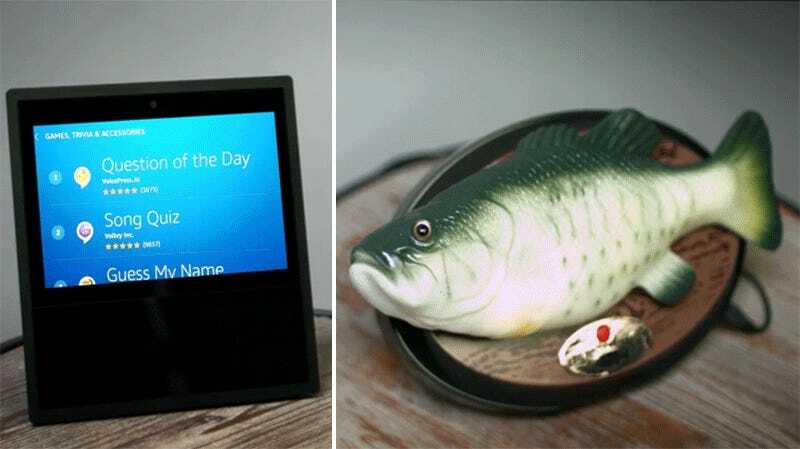 It’s one of the most common hardware hacks you’ll find online, but for those who don’t know the first thing about soldering, there’s now an upgraded version of the Big Mouth Billy Bass that can respond to voice commands right out of the box, courtesy of Amazon’s Alexa. You heard that right, we’re still a little over three weeks away from Christmas, but you can already scratch every aunt, uncle, and cottage-owner off of your holiday shopping list as Billy once again goes on sale starting on December 1 for about $40. At first glance, the new version looks identical to the original, complete with a red button for manually starting a performance of an included song called ‘Fish In’ Time.’ What’s less obvious is that this version of Billy can connect to your smartphone and the Alexa app over Bluetooth, so that every time you ask the smart assistant a question, or request a song, Alexa’s response will appear to be spoken from the fish’s mouth. It also works alongside basically every Alexa device Amazon sells, right up to the second-generation Echo Show. While Billy is “compatible with Alexa,” it doesn’t appear to work on its own like a standalone Alexa speaker. Like the original Big Mouth Billy Bass, the Alexa support will almost certainly lose its novelty after about 10 minutes. But if you’ve been trying to convince your tech-cautious family to try out a smart assistant, this could be the irritating gateway drug that gets them hooked.